Worksaver’s new RBH-4500 Bale Handler fits tractor front loaders and handles and stacks either two 4’ x 4’ x 8’ or three 3’ x 3’ x 8’ large rectangular bales. 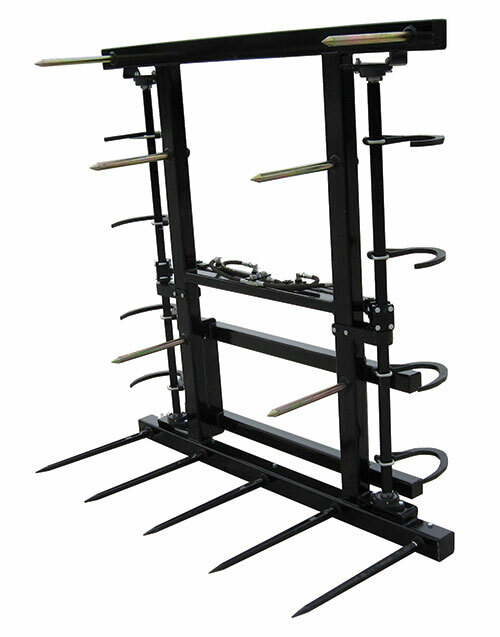 This bale handler features five 26” long forged spears spaced along the bottom of the unit for bale support and six, 21” long forged spears for the uprights to help secure bales in transport. Each side offers four, moveable bale hooks, 11” x 12” x 3Ž4”, which allow the operator to position the hooks in the most convenient location. Four flange bearings provide smooth operation of the hook shafts. The RBH-4500 replaces Worksaver’s RBH-4000 Bale Handler. For more information, contact Worksaver, Inc., P.O. Box 100, Litchfield, IL 62056-0100. Phone: 217-324-5973. Fax: 217-234-3356. Website: http://www.worksaver.com/front-loader-bale-spear-rbh-4000-large-rectangular-bale-handler. E-mail: sales@worksaver.com.